This three days jungle trek in Gunung Leuser National Park is a great option to discover and really experience the tropical rainforest of North Sumatra. 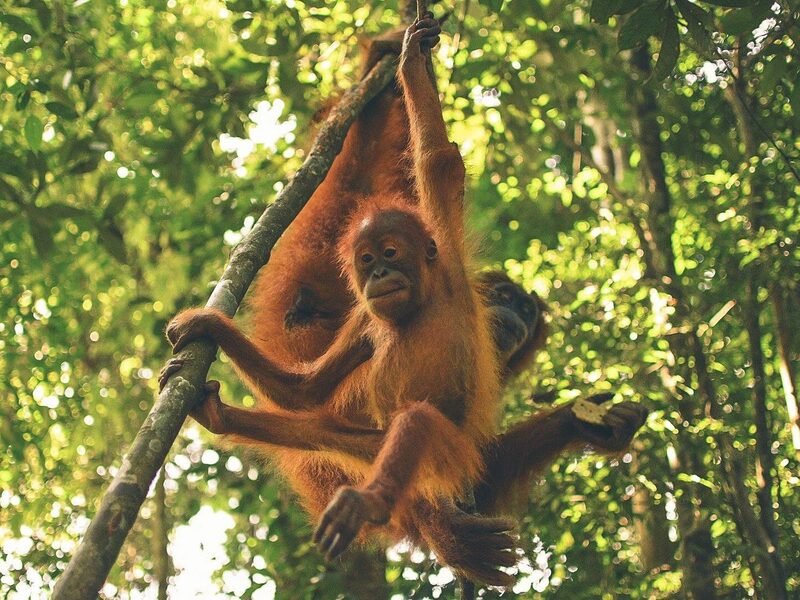 During this three-day trek you will go deeper into the jungle, which gives you great chances of seeing orangutans up-close in their natural habitat. You will stay overnight in two different camps in the Gunung-Leuser National Park. Around 9AM, your English speaking, licensed guide will pick you up from your guesthouse in Bukit Lawang. From there you will walk towards the border of the Gunung Leuser National Park. The walk towards the park towards the park is already a great experience. There is a chance to encounter some monkeys, you will pass a garden and a rubber plantation. Your guide will explain about the animals and how rubber is made. Another 10 minute walk will bring you to the entrance of the park. From here you will start your jungle adventure. During this three-day trek you will have a great chance of observing a wide variety of wildlife, which your guide will point out to you. He will explain about all plant species and animals you will encounter in the rainforest. Animals such as orangutans, gibbons, Thomas leaf monkeys, Sumatran Great Argus, pigtail macaques, flying squirrels and hornbills. But you will also see beautiful species of trees and tropic plants. The third day in the morning you will wake up again to the sounds of the jungle. If you are lucky you can observe the Sumatran monitor lizards, tortoises and colorful river butterflies around the campsite. After a good breakfast you will have the opportunity to walk again for 2 hours or just relax and swim at an amazing waterfall next to the campsite. After a light lunch it is time for you to return to Bukit Lawang. And that is around 1 hour full of fun! 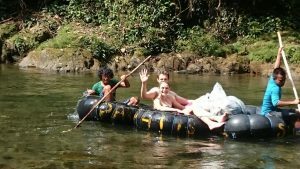 Because your “jungle taxi” with your personal captain will bring you back to your guesthouse by traditional tube-rafting down the Bohorok River (surcharge).